Second to playing Santa, I love being able to play Easter Bunny! The girls have lovingly begun calling him Mr. Bunny, I think because to them "Easter" sounds a lot like "Mister". Whatever the reason, it makes this holiday all the more fun. 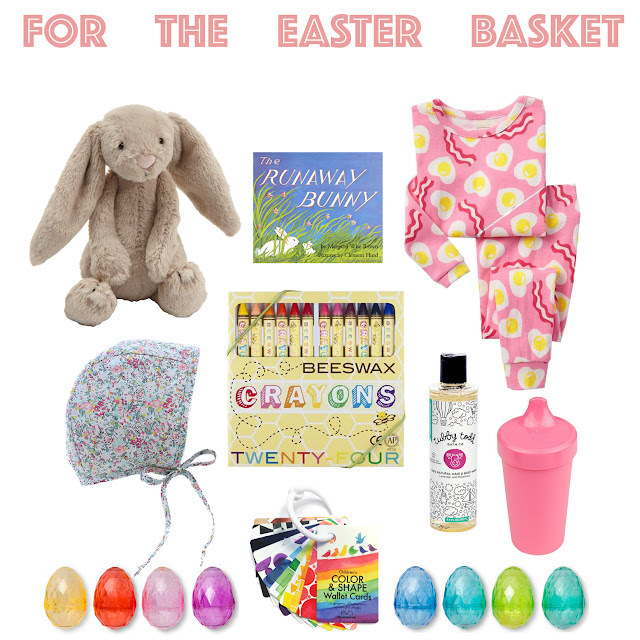 They get so giddy when talking about him and what they might find Easter morning and it is so much fun to curate little spring baskets tailored to their individual interests. When picking out goodies I like to look for things that can be used all season long, not just the typical Easter novelty items. I will also add some smaller trinkets and maybe one big ticket item and the baskets are ready for the Easter morning hunt. Here is the roundup for all of the fun things I am thinking about putting into the girls' baskets this year! Some other great items to include are bubbles, play doh, snacks, wooden teethers, bath toys, toy cars, beach or garden toys and nail polish. What are you putting in your little one's basket this year?